A Fatty liver is just that, the buildup of actual fat in your liver. When 10% or more of the actual weight of your liver consists of fat, this then would be considered as a fatty liver. What Causes the Liver to become Fatty? Unhealthy lifestyle choices such consuming too much high cholesterol greasy / fatty foods and or excess alcohol and drugs /synthetic medication. A combination of one or more of the above can cause the liver to be overworked and overloaded and as a result ends up storing fat inside the liver. A Fatty liver usually does not cause any harm, but it can lead to serious liver damage, including cirrhosis, if the liver continues to get abused, overloaded and overworked. What are a few of the most common signs of a Fatty Liver Liver? Although there are no specific symptoms to show you have a fatty liver other than feeling fatigue and or discomfort in your abdominal area, it is something your doctor can easily detect. A quick check you should do every morning in your bathroom mirror is checking the whites of your eyes, they should be crystal clear white, if they are slightly yellowish or worse dark yellowish (also referred to as Jaundice) this is a strong indication of an overworked / overloaded liver. The colour of your urine, its okay for the colour of your urine to sometimes be slightly yellow due to dehydration, but if it is regularly yellow, dark yellow or worse orange this is another indication of an overworked / overloaded liver. Fatigue, its okay to feel lazy sometimes, but if you constantly feel sluggish and fatigued and you find that walking or exercise doesn’t help much this is another sign of an overworked / overloaded liver. Can a Fatty Liver be Reversed? What happens is a Fatty Liver goes Untreated? A fatty liver does not cause permanent damage in itself, but if too much fat starts to build up in your liver then your liver can’t do its job of detoxing properly. This can put you at risk to a more serious liver condition known as an "enlarged liver". Although the liver technically has the unique ability to detox and repair itself by rebuilding new liver cells whenever old liver cells get damaged. However if you put too much demands on your liver then your liver can end up being overloaded and overburdened with toxicity this can takeaway the liver's ability to detox and repair itself at the same rate of speed to counter the damage that is being done. What is the Best Treatment for a Fatty Liver? There are no specific medications or surgeries to treat fatty liver. Your doctor will instead advise you to eat more healthy every-single-day. Unfortunately this "general advice" is easier said than done. As this new healthy habit can end up being a hassle to shop for and very time consuming to prepare every-single-day, especially for those days where you don't feel like eating at all, as a result you eat healthy some-days and not so healthy on other days. 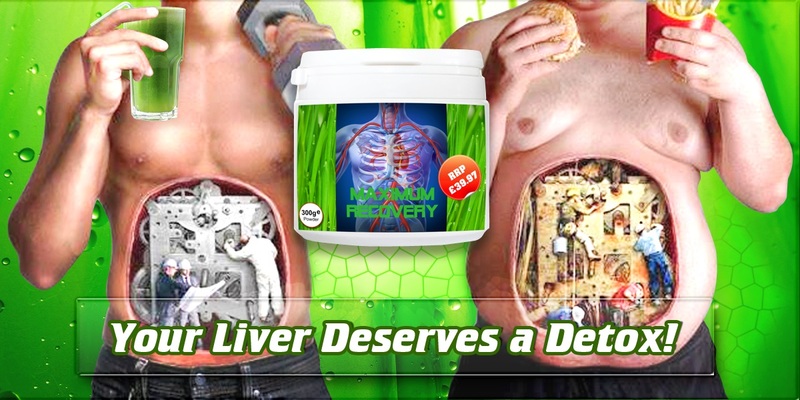 Maximum Recovery is a perfect healthy organic solution for the time poor... Forget “5 a day” Maximum Recovery contains 35 Super-Foods per scoop each organic ingredient contained within has a proven benefit for your Liver... best of all it just takes 30 seconds to prepare and consume! Take this in combination with Liv-Re-Gen x3 capsules per day, just x1 after each meal to really help kick start your Liver’s Metabolic rate in order to get back upto speed.